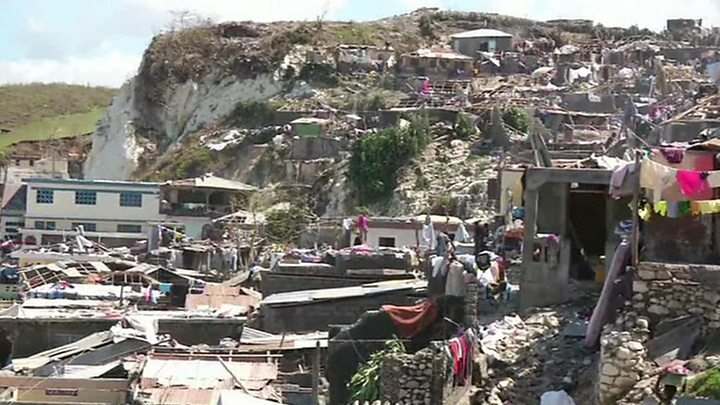 Parts of Haiti's south had faced "complete destruction", aid workers told the BBC. The US National Hurricane Center (NHC) has downgraded it to a Category One hurricane, with maximum sustained winds having decreased to 75mph (120km/h). But the NHC warned of a "serious inland flooding event unfolding". Hurricane response: How do Haiti and Florida compare? Media captionBBC Weather's Ben Rich looks at the latest forecast track of Hurricane Matthew. "The entire house fell on us. I couldn't get out," Jean-Pierre Jean-Donald said. "People came to lift the rubble, and then we saw my wife, who had died." The storm passed directly through the Tiburon peninsula - encompassing Haiti's entire southern coast - driving the sea inland and flattening homes with winds of up to 230km/h (145mph) and torrential rain. "What we've seen thus far has been a fairly large-spread destruction in the south, potentially at points of 90% destruction in some of locations - complete destruction." Her team's helicopter had not managed to land in some of the damaged areas. The Red Cross has launched an emergency appeal for $6.9m (£5.6m) "to provide medical, shelter, water and sanitation assistance to 50,000 people". This comes amid concerns about a surge in cholera cases, with the sanitation system in Haiti already overwhelmed. Haiti - one of the world's poorest countries - has never fully recovered from the earthquake in 2010 that killed thousands of people and a cholera epidemic that followed. After slicing through Haiti and Cuba, Hurricane Matthew pounded the Bahamas on Thursday but no fatalities were reported there. Four people were killed in Florida as the storm hit on Friday. More than a million homes have lost power. Four people died in the neighbouring Dominican Republic on Tuesday. US President Barack Obama on Friday warned that, while southern Florida had been spared the worst, the hurricane remained very dangerous, with the risk of a storm surge and flooding. A state of emergency is in place in several states and at least three million inhabitants have been ordered to evacuate their homes.